Chick-Bator (top photo in this section) from GQF Manufacturing holds 3 chicken eggs or 2 duck eggs. It is about $20. 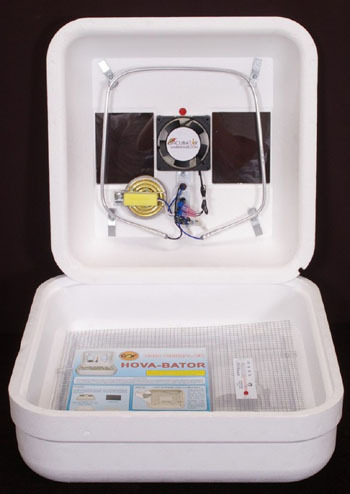 GQF Manufacturing sells the Hova-Bator Still-Air Incubator (second photo in this section). It holds 42 chicken or duck eggs. It costs around $60. A Hova-Bator Circulated-Air Incubator is about $100. You get a better hatch rate with the circulated air model. The Genesis Hova-Bator holds 50 chicken or duck eggs. It has digital temperature and humidity displays. It is 12 volt but can be used with 110 volt. It is circulated air. It sells for $132. You can get an automatic egg turner that works in these for $50. That way you don't have to turn the eggs manually 3-4 times a day. For professional quality GQF sells the 1202E Classic Sportsman for $650 (third photo in this section). It has an automatic egg turner. It holds 270 chicken eggs or 198 duck eggs. It has a very good hatch rate. Little Giant (fourth photo in this section) sells a still-air incubator for around $60 (Models 9200, 9300). It has a digital temperature and humidity display. It holds 41 chicken or duck eggs. They also sell the Little Giant incubator with a fan to circulate the air. Same as the above. Sells for $75. They sell an automatic egg turner for $50. They are similar to the Hova-bator. Farm Innovators sells the Pro Series Model 4200 incubator (fifth photo in this section) that is a circulated-air incubator with automatic turning tray for $120. It has a thermometer and humidity guage. It holds 41 eggs. It is similar to the Hova-Bator. Their Model 2200 incubator is the same as Model 4200 except it does not have an egg turner. It sells for $85. For more money they sell incubators similar to the above that have digital display of temperature and humidity, factory temperature pre-set, and temperature alarm. 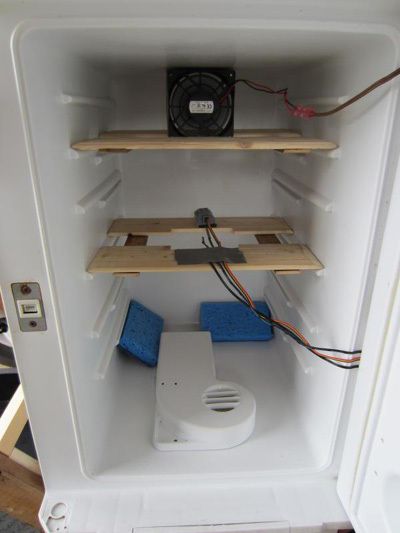 To save money you can get a computer fan or other small fan, and add it to a still-air incubator. Though a fan made for an incubator works better. If you go with Hova-Bator, Little Giant or Farm Innovators, it is important that the room they are in stays at a stable temperature. If the room temperature changes a lot, it is harder for them to maintain the correct temperature. 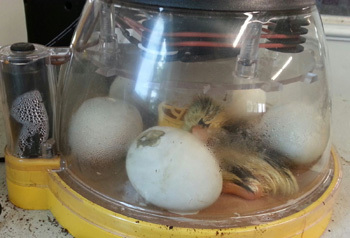 It is easier to regulate the temperature in an incubator that is full of eggs. The Brinsea does a better job of maintaining temperature and humidity. 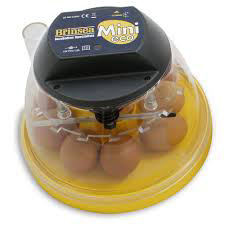 Brinsea sells the Mini Eco (holds 10 chicken eggs or 8 duck eggs, $100, first photo in this section). It has fan-assisted circulated air, and a glass thermometer. There is no automatic egg turning. 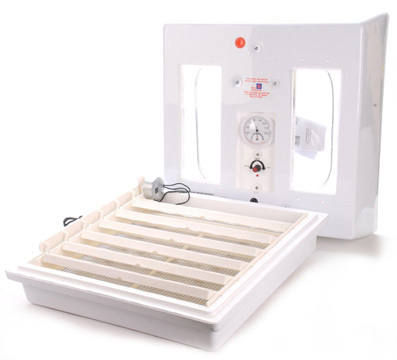 It sells the Mini Advance Incubator ($200) and the Mini Advance EX Incubator ($400). 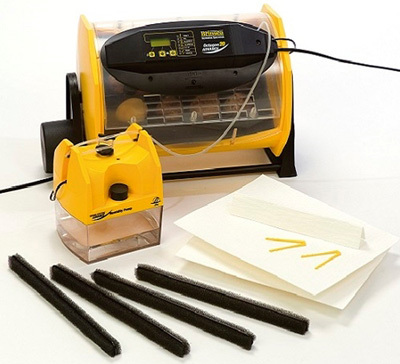 The Mini Advance models have fan-assisted circulated air, automatic egg turning, egg cooling, and digital thermometer. They both hold 7 chicken or duck eggs. 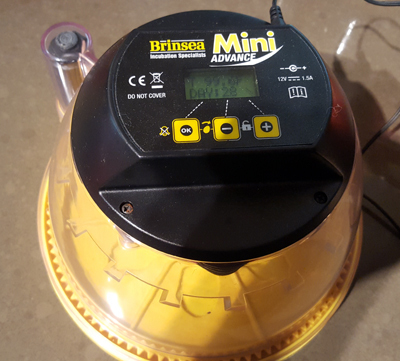 The Mini Advance EX has automatic humidity control and humidity guage. The first photo is a Mini Advance taken by Sandra in Durham, North Carolina. The third photo in this group of incubators is a 7-egg Brinsea Advance incubator with Ancona duck eggs and 1 duckling in it. The photo is from Tim and Jane in Kentucky. Brinsea sells the Octagon-20 Eco Incubator for $200. It is the third photo in this section. It has fan-assisted air circulation, automatic temperature control, and a glass thermometer. It holds 24 chicken eggs. You can add automatic egg turning for $90. The Octagon-40 Eco Incubator retails for $470. 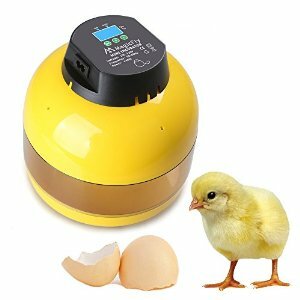 It has fan-assisted air circulation, automatic temperature control, automatic egg turning, and a glass thermometer. It holds 48 eggs. They have the Octagon-20 Advance Incubator for $400 and the Octagon-40 Advance for $600. They both have fan-assisted air circulation, egg turning, egg cooling, automatic temperature control, and digital temperature/humidity display. The 20 holds 24 chicken eggs, and the 40 holds 48 eggs. The fifth photo in this section is the Octagon-20 with my Dominique eggs. They sell the Octagon-20 Advance EX incubator for $560 and the Octogon-40 Advance Ex incubator that is $700. They are the same as the Octagon Advance above except they have automatic humidity control. The Octagon-20 (sixth photo) holds 20 chicken eggs, and the Octagon-40 holds 32-40 eggs. The photo with the 2 incubators is the Brinsea Maxi II. Krista-Lea in Port Jefferson, New York took the picture. 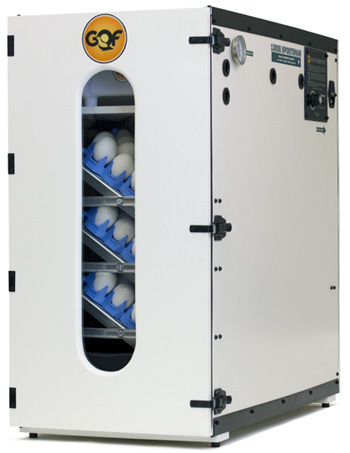 Brinsea sells Ova-Easy cabinet incubators holding 96 to 576 chicken eggs for $1000 to $2000. They are fully automatic. It is the last photo in this section. All of these prices are Brinsea's suggested prices. You may be able to get a better price. Check out reviews at Amazon before you buy. All Brinsea incubators are factory set at 99.5 degrees. Brinsea incubators are higher quality (and price) with a better hatch rate than the Hova-Bator or Little Giant. It is good if you have valuable eggs. If you are going to hatch a lot of eggs, they are worth the money. 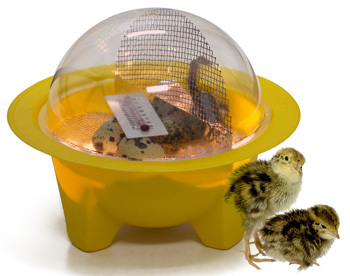 R-Com Bird Incubators are high quality. They range from $150 to over $1000. 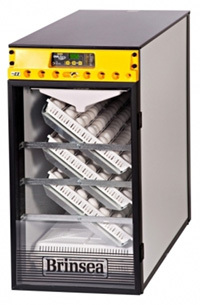 The R-Com Mini Digital Incubator holds 3 eggs. It has automatic temperature and automatic turning. It is programmable. It sells for $90. 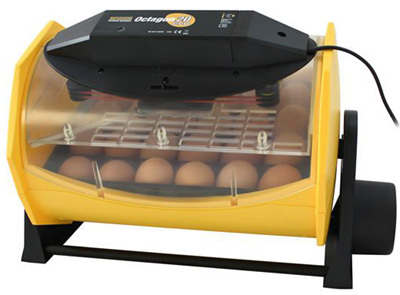 The R-Com Mini Digital with EZ-Scope includes an observation candler and the Mini-Pro egg incubator with automatic temperature, humidity control, and automatic turning. It holds 3 eggs. It is around $150. 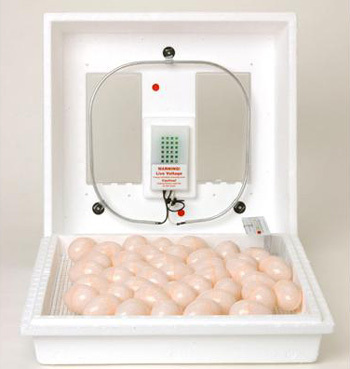 The R-Com King Suro-20 incubator has automatic controlled temperature, humidity and cradle egg turning. It holds 24 eggs. It is around $300. It is the first photo in this section. You may find some of the used expensive ones on eBay at a price you can afford. You can also build your own incubator. The absolute very best incubator is a broody hen! Generally speaking, Bantam (Bantie) hens go broody more often than standard-size chickens. I sell Bantam eggs for hatching. 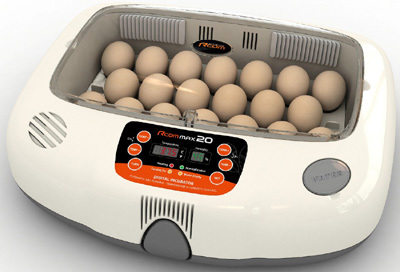 Magicfly sells the Digital Egg Incubator with egg turner that holds 10 eggs. It is $75. It has an LED temperature display. Easy to use.